Turkey Detains Journalists From The Country's Top Opposition Newspaper : The Two-Way It's the latest move in a sweeping government crackdown that began following a failed coup attempt in July. The government also reportedly closed 15 media outlets over the weekend. A man holds up the latest copy of Turkey's opposition Cumhuriyet newspaper outside its headquarters after Turkish police reportedly detained the chief editor and at least eight of its senior staff on Monday. Turkey has arrested senior staff members from the country's foremost opposition newspaper. It's the latest move in a sweeping government crackdown that began following a failed coup attempt in July. The top prosecutor in Istanbul issued arrest warrants for 13 journalists and executives from the opposition daily Cumhuriyet, according to Turkey's state-run Anadolu news agency. Police have reportedly arrested 11 of the staffers, including the editor-in-chief, writers, a cartoonist and a book editor. "This is a comical situation," cartoonist Musa Kart told journalists before his arrest, according to Reuters. "I would like to say that you won't be able to frighten anyone with pressure. It is not possible for people with a conscience to accept this. You can't explain this to the world. I am being detained solely for drawing caricatures." An unnamed judicial official tells Anadolu that the staffers are charged with "being members of the Fetullah Terrorist Organization and the PKK [the Kurdistan Worker's Party], and for committing crimes on behalf of those organizations." FETO is a reference to Fethullah Gulen, the U.S.-based cleric that Turkey's government blames for attempting to launch the coup. Gulen has denied any involvement in the events. Since then, the government has carried out a broad purge, and approximately "100,000 people in Turkey have been suspended, arrested or fired," as NPR's Peter Kenyon reported earlier this month. That number has now grown: From Istanbul, Dominique Bonessi reports for NPR that "over the weekend, 10,000 civil servants were also dismissed." She adds that "Cumhuriyet's former editor-in-chief, Can Dundar, is also being charged, but he fled Turkey in August after being sentenced to five years in prison for revealing state secrets about Turkey's operations in Syria." In mid-October, the government extended its emergency powers for three more months, drawing criticism that it is trying to stamp out all opposition. As the BBC reports, Cumhuriyet's front page Monday morning carried the headline, "Coup against opposition." The piece was about "the suspension of thousands of civil servants and other laws introduced under emergency decrees." 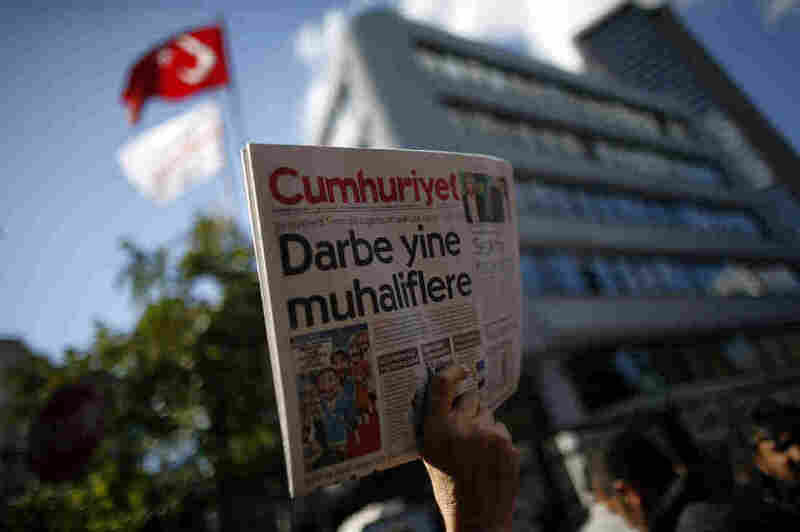 The arrest warrants were issued within hours, and supporters of the paper rallied outside its office in Istanbul, holding up copies of Monday's edition. The government also closed 15 news outlets over the weekend, the Committee to Protect Journalists said in a statement. This effectively "eviscerated what remained of the country's Kurdish media," the press freedom advocacy group said in a news release. The group cited news reports that said police have "raided and sealed" their offices, and "their assets will be transferred to the state treasury." Readers shout slogans as they hold the latest copy of Cumhuriyet in Istanbul. The BBC says the headline reads: "Coup against opposition."